When Shazan's sister called me to tell me about the small, personal ceremony that was being planned for Srusht + Shazan, I could just tell it was going to be fun. They did not disappoint! 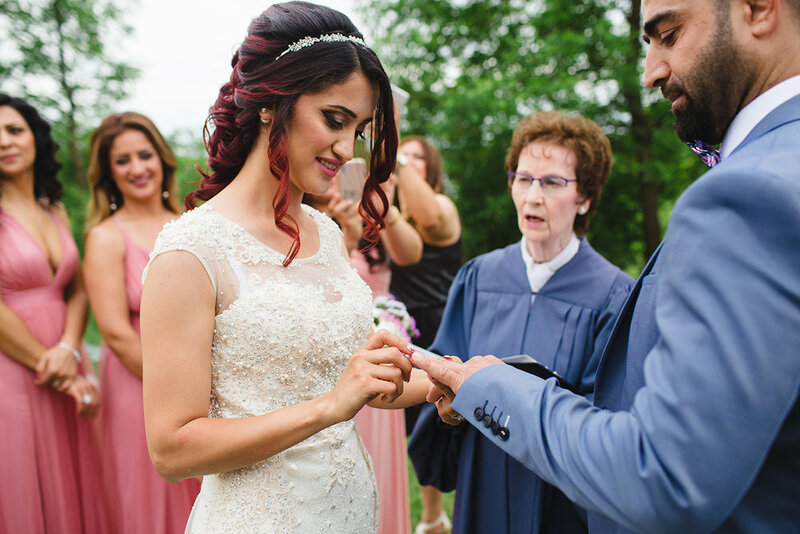 We convened on a bright but overcast day on a slope overlooking Guelph Lake, where a handful of family members and friends waited for them to take their vows. Srusht beamed as his bride made her way toward him down the aisle, with shouts of encouragement and happiness from all in attendance. Once her father gave her hand to Srusht, Shazan looked happily at her groom as her junior bridesmaids gently laid down her train. As the ceremony progressed, things quickly relaxed, with the bridal party and guests moving about freely to take photos and video of the ceremony - it was fun to see how close everybody was willing to get for just the right shot! I was dying laughing when one bridesmaid starting taking selfies at the end of the line of girls - everyone was so awesome! 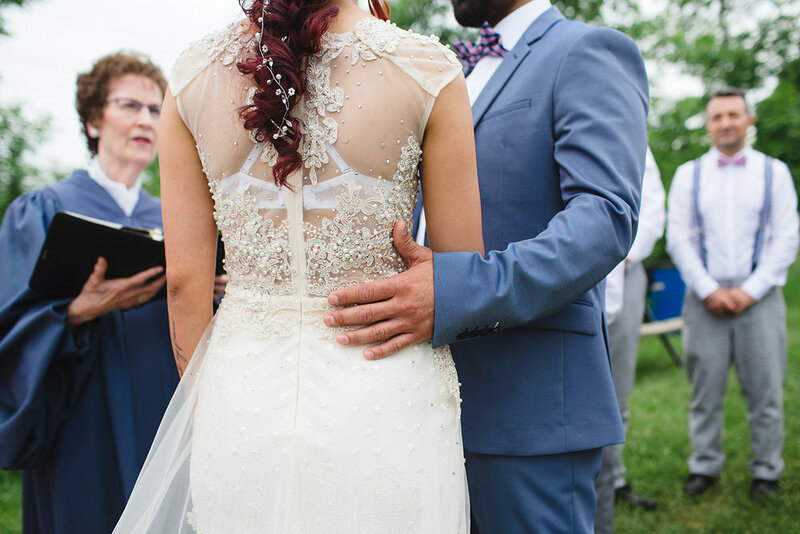 It felt a wee bit like a media scrum, as the best man loudly translated the vows, which the couple faithfully repeated in both their native language and English as required, and I jostled with the crowd to get the best angle for myself! Honestly, I know a lot of photographers may have been frustrated or annoyed by the melee but it was vibrant and exciting and an experience I won't ever forget. The vows made and rings exchanged, they signed the paperwork before making their way back down the aisle, with everyone following them in joyful song, dance and hollering. For as small of a group as we were, no one failed to make up for it in volume. My talk loudly voice was for once appreciated and fit right in with this family! A few portraits and bridal party shenanigans before I left them to finish celebrating the day, as they headed toward the beach, intent on dipping their toes. All in all, it was one of the most dynamic, fast-paced two hours I have ever spent at a wedding and I loved every minute of it. It was a really, really good day. Thanks Srusht + Shazan (and Jwan!) for trusting me to photograph this day!